Bellevue College is committed to ensuring a safe educational and work environment for employees, students, and visitors. The Public Safety department has prepared this Comprehensive Emergency Management Plan to ensure the most effective response possible for the protection of students, employees, and visitors during emergency events. The purpose of the Comprehensive Emergency Management Plan (CEMP) is to determine roles and responsibilities for establishing emergency readiness and response to hazards that may affect Bellevue College. 2. Protection of college property and the surrounding environment. 3. Minimizing the impacts on the campus community. The purpose of this plan is to establish a comprehensive, all-hazards approach to incident management, and to guide activities before, during and after a disaster. This CEMP describes capabilities, resources, establishes roles for emergency response in accordance with Revised Code of Washington (RCW) 38.52, and with guidance from both the University of Washington CEMP (February 2017) and the Washington State CEMP (June 2016) for addressing all five mission areas of emergency management: Prevention, Protection, Mitigation, Response, and Recovery. Manage immediate communications and information regarding emergency response operations and campus safety. Manage campus resources effectively during an emergency response. This plan does not replace or supersede any procedures for emergency response or safety already in place at the College. It supplements these procedures with crisis management structure for response operations. The CEMP will be evaluated annually to ensure it reflects current regulations and campus needs. Following emergency events, After Action Reports will be developed to determine areas of necessary training and editing of the CEMP. RCW 38.52.070(1) (also requires that local comprehensive emergency management plans must specify the use of the incident command system for multi-agency / multi-jurisdiction operations). Robert T. Stafford Disaster Relief and Emergency Assistance Act/Public Law 93-288, as amended (addresses the role of the Federal Government). Current applicable 44 Code of Federal Regulations (CFR) address policy and guidance for Federal Government disaster response and recovery. RCW 38.52.030 (11) (each state agency is responsible for developing an organizational continuity of operations plan that is updated and exercised annually in compliance with the program for interagency coordination of continuity of operations planning). 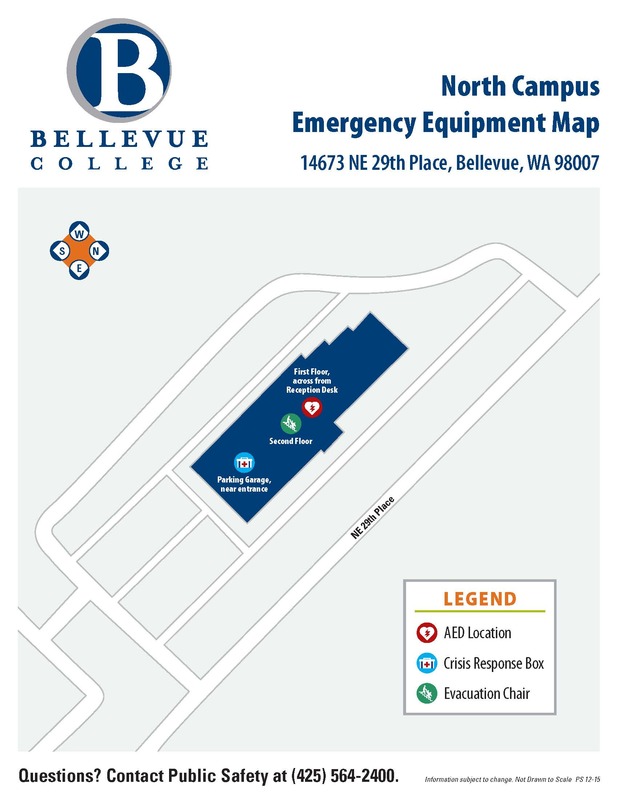 The scope of this Comprehensive Emergency Management Plan (CEMP) does not cover the college programs and courses offered on sites not controlled by Bellevue College. 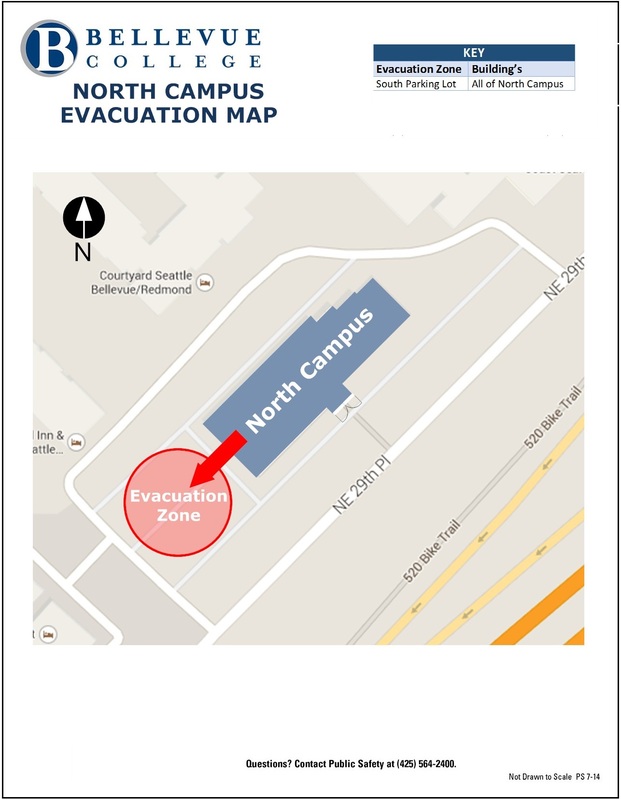 Bellevue College employees working off-site should be aware of the emergency plans specific to their site. Each building or division should create their own Continuity of Operations Plan to better respond and recover to emergencies on a department level. A template and general guidelines for this plan can be obtained from the Emergency Operations Officer. This CEMP is an all-hazards document that evaluates and provides general response mechanisms for natural and man-made emergencies that may arise on the Bellevue College campuses. The flexibility of the CEMP allows for accommodation of emergency events of various types and severities. Provides an overview of how to implement emergency management, and details responsibilities. Uses federal guidance and supporting plans including the National Prevention, Protection, Mitigation, Response, and Disaster Recovery Frameworks, as well as FEMA’s National Incident Management System (NIMS) and Comprehensive Planning Guide. Describes functions and activities necessary to implement the phases of emergency management (mitigation, preparedness [including prevention and protection], response and recovery) in the Concept of Operations and Responsibilities sections. Defines activation of the Emergency Operations Center (EOC) in the Concept of Operations section. Bellevue College is an incredibly diverse campus with over 30 languages spoken by students and staff and students from over 60 countries. The Main Campus employs over 2,000 staff and faculty members with a total student body of over 23,000. However, a maximum of about 7,000-9,000 students are ever on campus simultaneously. The peak population of the employees and students are on campus during normal business hours between 8am and 5pm. The North Campus employs over 80 staff and faculty members with a student body of over 500. The on-campus student housing consists of up to 400 students. The Main Campus is comprised of 18 buildings, one greenhouse, multiple houses, one parking garage, and on-campus student housing. Two buildings have science labs with gas connections and chemical substances. A third building houses surplus cleaning supplies and a HAZMAT shed. One building is an early learning center with approximately 100 children at peak times. The North Campus consists of a single, multistory building and the East Campus has not yet broken ground. Please refer to the detailed maps in Appendix B for main campus and Appendix C for North Campus. The Main Campus has one centrally located AED in each building. North campus has one in the reception area of the lobby. The AEDs are checked quarterly to ensure that all devices and accessories are fully operational. Fire extinguishers and First Aid kits are located in several locations on every floor of each building on both college campuses. There are 15 crisis response boxes distributed evenly among the buildings of the Main Campus and one located in the parking garage of the North Campus building. Each box is painted blue and labeled “Crisis Response” and are intended to supply individuals during emergency events such as earthquakes, floods, or snowstorms until emergency responders can begin rescue efforts. Each box contains flashlights, blankets, water, response kits, first aid supplies, flares, carry tarps, and personal protection equipment that should sustain Bellevue College for approximately 3 days. For all other emergency equipment and resources, please see the Emergency Management inventory list. Please refer to the Emergency Equipment maps in Appendix B for main campus and Appendix C for North Campus. Natural hazards that could directly impact Bellevue College Campus include earthquakes, fires, floods, severe storms, and ash fall. Human-caused hazards that could affect Bellevue College include; hazardous materials, chemical incidents, terrorism, and active shooter. These hazards have the potential to cause extenuating issues such as power and other utility disruptions that can create further hazards. 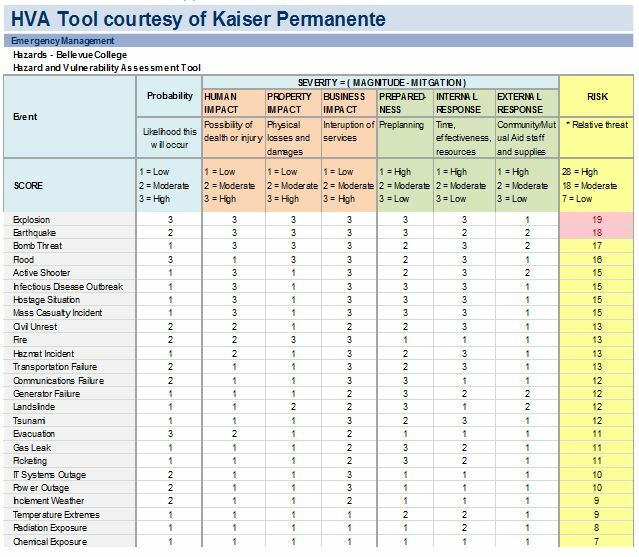 These hazards were assessed based on a 1 (low) to 3 (high) scale for probability, human impact, property impact, and business impact, plus 1 (high) to 3 (low) scale for the campus’ preparedness planning, internal response capabilities, and external response capabilities. Added together these create our relative risk scale from 7(min) to 28(max). Public Safety is responsible for preparing and responding to emergencies and disasters on campus. They offer trainings, exercises, and handout materials to help students, staff, and faculty prepare for disasters. Some emergencies or disasters will occur with enough warning that appropriate notification will be issued to ensure some level of preparation. Other emergencies or disasters will occur with no advanced warning. The extent of the challenges created by emergencies or disasters depends on factors such as time of occurrence, geographic area, severity of impact, weather conditions, area demographics, nature of building construction, and the status of communications and cyber systems operability. Collateral incidents such as fire, floods, hazardous materials releases, or mass cyber systems outages will occur and increase the impact on the community, multiply losses, and hinder immediate emergency response efforts. A disaster may occur with little or no warning; may escalate rapidly, requiring outside assistance from other public and private sector partners. Critical utilities may be interrupted including water delivery, electrical power, natural gas, telephone communications, microwave and radio systems, cellular telephones and information systems. The National Incident Management System and Incident Command System will be the foundation of all emergency response activities before, during, and after an incident and/or disaster. Initial response by Public Safety Officers and all other partnering agencies will be to take actions that have the greatest lifesaving potential under the circumstances. Regional and local services may be limited in capabilities or not in service. Bellevue College administration must continue to function under all threats, emergencies, and disaster conditions. The CEMP must be flexible and be able to function under a variety of unanticipated, complex, and unique circumstances. Day-to-day functions that do not contribute directly to disaster operations may be suspended for the duration of the public emergency. The efforts that would normally be required for these functions will be redirected to accomplish disaster management and response tasks. Incidents may cause significant injuries, alterations, and damage to the environment resulting in numerous casualties and fatalities, displaced individuals, property loss, disruption of normal life support systems, disruption of essential public services, and damage to basic infrastructure. Incidents pose a challenge for the whole community but specifically the access and functional needs population which includes children, individuals with disabilities, diverse communities, the elderly, homeless, and people with limited English proficiency. These groups may be lacking in resources such as food, shelter, and transportation. This CEMP and the accompanying appendices are not meant to deal with every potential scenario that could occur during an emergency, but rather to create a flexible framework which can be used to organize and delegate responsibilities during a response. It is entirely possible that local resources will be overwhelmed in a major incident or disaster. Partnering agencies may have a limited ability to respond to the campus based on the situation and available resources at the time of the disaster. In the event of severe devastation through the Puget Sound Region, fundamental survival resources may be needed. Bellevue College does not have sufficient supplies and equipment for an extended response. The arrival of state and/or federal aid may be delayed for several days after an incident. There is no guarantee implied by this plan that perfect emergency management will be practical or possible. Executive staff will designate successors to ensure continuity of leadership and operations. Successors should be aware of their emergency responsibilities. It is advantageous for each department/division to create a Continuity of Operations Plan (COOP). These plans should clearly specify alternate operation locations, emergency response procedures, and alternate means of communication. Administrative Services will follow protocols to preserve student records in the case of an emergency. If an activation of the CEMP and/or EOC is required at Bellevue College, the President or designee will declare an emergency utilizing the Declaration of Emergency template in Appendix D.
The City of Bellevue will coordinate their emergency response effort to an emergency or disaster within their jurisdiction and should declare or proclaim a state of emergency in accordance with local codes, charters, or ordinances. When the incident exceeds the capacity of the city, their emergency management agency will request assistance through county. Bellevue College’s EOC does not operate unless activated for an emergency. Public Safety employs security and dispatchers to respond to individual incidences and requests for assistance. At this time, Bellevue College Campus Security cannot mandate EOC training to individuals. However, it is recommended that those who will serve in any capacity in the EOC take ICS 100, 200, 700 and 800 at a minimum. We are currently in the process of conducting tabletops to further clarify roles during an emergency and our recommended further trainings. Definition: A small incident or event that requires coordination with outside agencies, such as severe weather, interfacing with first responders, or escalating an incident. The on-site lead/department will notify Public Safety and the Director of Public Safety or designee of the incident. The Incident Commander (Director of Public Safety or designee) will monitor the situation and provide guidance on expanding or calling in more resources. The Director of Public Safety or designee may choose to open the EOC. If the incident has the potential to grow, the Incident Commander will notify necessary EOC leadership and support staff. Definition: A major scheduled event (e.g. conference or sporting event), or an emergency incident that is severe and causes damage to Bellevue College Campus and/or interruption to Bellevue College operations. Coordination of external resources and campus resources is needed to respond effectively. A partial activation of the Emergency Operations Center is needed. Public Safety staff sets up the EOC and calls on support staff for assistance. Some operations and classes may be suspended. Unified command with local police, fire, or EMS personnel may be implemented. Public Safety will designate a Liaison to serve as a connection to the external agencies. Definition: The emergency situation is a disaster condition and Bellevue College must fully activate the Emergency Operations Center to address and immediately respond to the emergency. This includes a regional disaster, active shooter scenario, multiple agencies deployed to campus for support, potential extensive evacuations of the site, etc. In the case of a regional disaster, Bellevue College may request mutual assistance from the local police agencies, local fire agencies, the City of Bellevue, King County Zone 1, King County, other higher education institutions, and/or other City/State agencies. The Emergency Operations Plan and Center are fully activated. Normal operations are suspended. Staff vacations and planned leaves may be terminated. The Emergency Operations Center coordinates efforts with the City EM, King County Zone 1, King County EM and/or State as needed. Unified Command is used to manage incident response. Mutual aid agreements may be activated and aid is requested. Provide overall leadership within the EOC. Includes the Incident Commander, Safety Officer, Public Information Officer, and/or Section Chiefs. Overall direction, management and coordination for all operational functions. Establish Operational strategies and priorities for the response. Overall management and analysis of the disaster/incident. Assess information in order to create plans for every phase of the incident. Ensures all field, support, and EOC units are able to perform response activities with adequate delivery and tracking of resources and personnel. Provide overall management of financial accounting and analysis for the emergency response. Keeps leadership advised of costs, losses, and overall financial impact of emergency operations. Individuals assigned to coordinate with other agencies, departments, and key staff to relay important information and/or receive status updates per EOC leadership request. Members of the Communication Team will work within this group to monitor media releases, media requests, and develop official messages for Bellevue College’s response efforts. This section coordinates directly with the PIO and follows protocols found within the Crisis Communications Plan. also includes code enforcement through such activities as zoning regulations, land management, and building codes Encouraging citizens to be prepared and self-sufficient for a minimum of 72 hours. Preparedness actions develop operational capabilities in advance of an emergency or incident in order to mitigate or prevent an incident, and to protect visitors, students, staff, and faculty. Training and exercises are two critical activities of preparedness. Training activities range from familiarization of plans to practical application of systems and procedures. Exercises include discussion-based exercises (seminars, workshops, tabletops, and games) and operation-based exercises (drills, functional, and full-scale) in order to test the full spectrum of campus preparedness. 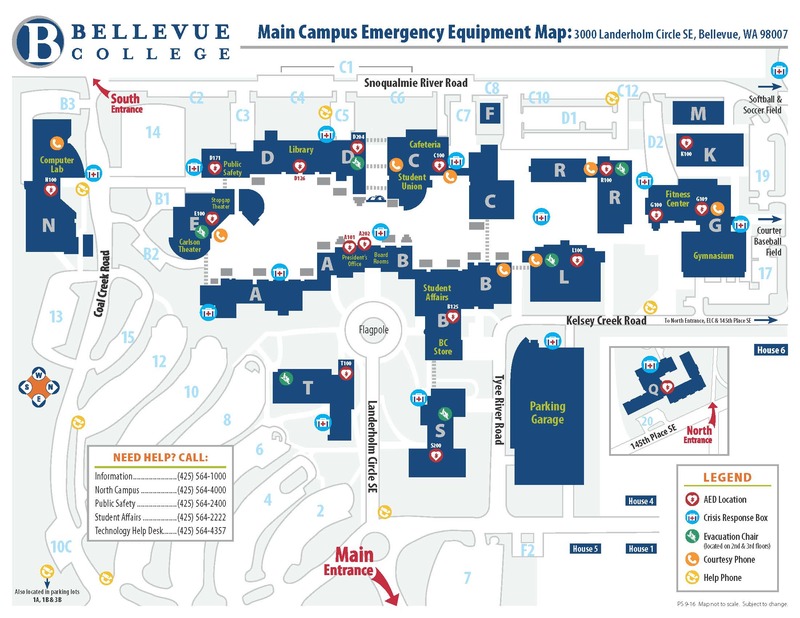 Bellevue College conducts lockdown and evacuation drills throughout the year for dangerous intruder and/or natural hazards for different departments on campus. The Public Safety Department also offers an array of classes for personal and departmental preparedness. Our goal is to conduct bi-annual tabletops with Cabinet staff to discuss various disaster and incident scenarios to clarify response roles and procedures. These will expand to tabletops and exercises as knowledge of the emergency response procedures is solidified and departmental Continuity of Operations Plans are completed. Bellevue College will have a campus-wide active shooter exercise in 2020. Public Safety has established response strategies and actions to be taken before, during, and after an emergency occurs. 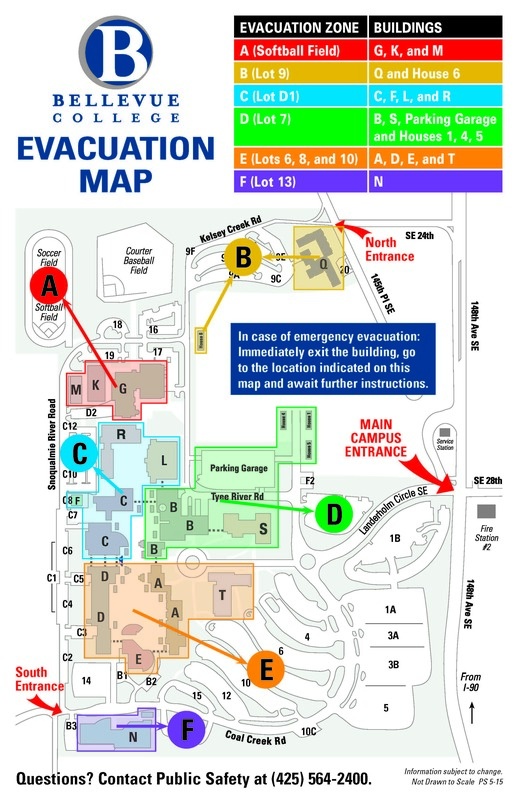 Evacuation maps can be found in Appendix B for main campus and C for North Campus. Please refer to the BC Emergency Response Plan for specific situational procedures. For responding to inclement weather, please refer to the Weather Emergency Procedures plan. Recovery planning starts concurrently with emergency response activities. The Executive Board will work directly with the Incident Commander to create a Recovery Plan and timetable which will be communicated to all involved parties. Recovery aims to re-establish business operations based on continuity plans. Bellevue College will conduct a post-disaster situation analysis and an after-action report to review and determine the effectiveness of established operating procedures, assigned tasks, and responsibilities. In the event of an emergency, notifying the population on campus is a top priority. 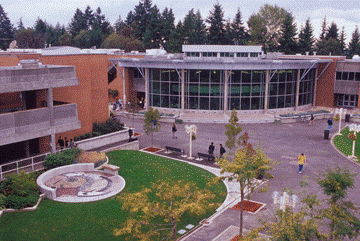 Bellevue College has multiple notification methods available to students, staff, and faculty. In the event of a Partial or Full Activation, the Crisis Communication Team will convene to execute the Crisis Communication Plan and notify the appropriate media sources as well as update BC social media. BC Alerts is a communication tool that is used to send e-mails, text messages, RSS posts, and updates to Bellevue College’s homepage. BC Alerts is hosted offsite, so it is not impacted by network outage on campus. The communication system allows Public Safety to deliver notifications in an efficient manner to those who may be impacted by emergency incidents. Note that BC Alerts are Opt-In and does not automatically register new students/employees. BC Alerts includes an application that is capable of transmitting messages to all campus IT issued desktop computers that run on Windows 7. BC Alerts sent through this application are immediately visible on the screens of all computers capable of running the application. Campus IT issued Macintosh computers, laptops, and OS X or Windows 8 computers are not yet supported by AlertUs. This public access system uses two large megaphones mounted on building rooftops facing inward, allowing Public Safety to transmit voice messages to the Campus that can be heard from miles away. Bellevue College has multiple plans available to guide communications during hazardous weather conditions or an emergency incident. Below is a list of those plans with a brief description of each one’s use. The Crisis Communications Plan is used to provide a system for when an incident or hazard is threatening the safety and security of the college community. It details procedures for convening the Crisis Communications Team as well as guidelines for communications and media response during an incident. For specific incident procedures and guidelines on PIO response, please refer to the Public Information Officer Emergency Procedures. The Weather Closure Communications Procedure details the types of closures likely to occur, how to make a closure decision, and how to notify the appropriate parties of the closure. This document details how to notify Safety Lead members of an occurring incident via the Duty Phone located in the Public Safety Office. “Because of [the incident] I am declaring a state of emergency for Bellevue College. I am also invoking the Campus Emergency Operations Plan, and activating the Emergency Management Team to start appropriate procedures necessary to meet the emergency response efforts, safeguard persons and property, and maintain the integrity of our campus facilities. In the event of an on-campus incident or disaster site, only emergency first responders, and those faculty and staff who have been assigned specific emergency response or recovery duties will be allowed to enter the immediate disaster site. All media access and communications to the public will be managed by the Office of Communications and the Public Information Officer(s). Any media desiring access to campus will report to the Communications Lead: [insert name and/or contact info]. Information flow to our College constituents will be via [insert media methods and/or person]. Please check the Bellevue College website for frequent updates on class scheduling and re-opening of the campus.